→Miracle Bamboo Pillow Review : Is It Comfy Or Scam? Miracle Bamboo Pillow Review : Is It Comfy Or Scam? Have you been suffering from uncomfortable sleepless nights? Does your pillow not feel soft and fluffy anymore? Well, before you feel even more frustrated, here is some good news for you. There is a wonderful solution in the form of a miracle pillow that can put an end to all your sleepless nights by providing you with that much-needed comfort. 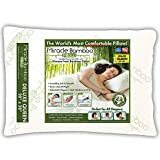 Now, if you have not heard about the miracle bamboo pillow before, then this miracle bamboo pillow review is surely going to enlighten you. What is this Miracle Bamboo Pillow? This Miracle Bamboo Pillow is a luxurious pillow that has been crafted out of premium viscose and memory foam. Since this viscose material has been extracted out of bamboo plants, the product has been named thus. The manufacturers of this Miracle Bamboo Pillow claim that it contains an outermost shell that is made of this viscose fabric. They have asserted that this viscose is much softer as compared to cotton and is even stronger as compared to silk. Moreover, it comes with ideal heat dissipative properties which make for the most comfortable sleep ever. The materials that have been used in the manufacture of this product are premium and hypoallergenic, which makes it suitable for use by all. The miracle bamboo pillow as seen on tv packs in a lot of conveniences and has been endowed with various cool features. Let us take a look at them here. Memory foam is known to be one of the latest discoveries when it comes to bedding and mattress solutions. Memory foam is soft and very supportive, which makes this pillow all the more convenient and comfortable for use. This Miracle Bamboo Pillow contains shredded memory foam that makes it very comfy yet supportive at the same time. The manufacturer of this Miracle Bamboo Pillow claims that no matter which side you prefer to sleep on, you will always find it very comfortable and convenient. If you are a back sleeper or a side sleeper or even if you prefer to lie down on your side, this pillow will conform to your shape and align itself wonderfully, so that you do not feel uncomfortable. The high-quality viscose derived from bamboo makes this a premium pillow. Not only does this material offer good strength and softness, but it also makes sure that you remain comfortable all throughout the night. It effectively draws out your body heat and regulates the heat properly, so that your pillow remains cool and the temperature is uniform all over. This translates to a better sleep at night. Many people are unable to use pillows that are stuffed with down or cotton or other materials. This is because there are various allergy-causing particles that might cause discomfort and health issues to those who are prone. 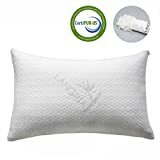 But this Miracle Bamboo Pillow is made out of top grade viscose and memory foam, which are hypoallergenic in nature. So anybody can use it safely and freely without worrying about developing allergies or facing respiratory problems. The manufacturer claims that this Miracle Bamboo Pillow combines 3 pillows into 1. You can fold it into half and use it like a firm but a comfortable pillow. You can, of course, use it in the usual flat form like a normal pillow. And, you can also use this pillow as a soft upright support when you want to read before bedtime or watch TV from your bedside. This pillow is also showed to be resistant to germs and microbes. It is also resistant to any sort of odour which might naturally pick up due to long-term use. The premium fabric used for its manufacturing also helps in preventing dust mites. And the cleaning part is also really easy since you can easily wash this pillow in your washing machine. The fabric does not get damaged or wear off easily since it made out of viscose. Now, when it comes to user reviews about this Miracle bamboo Pillow, there is not much that you may come across. But based on the reviews that we could find by searching all over the Internet it can be said that this product is quite popular already. Some of the users have mentioned that this is comfortable and pretty supportive too. However, the manufacturers do not clearly mention the percentage of bamboo fiber used in its manufacturing. Also, while other bamboo fabric pillows offer a lifetime warranty, this Miracle Bamboo Pillow only offers it for 30 days. Some of the users have also indicated that customer service is not prompt. are some of the brands that you can check out. As the final verdict, we feel that it is always good to set reasonable expectations by reading miracle bamboo pillow review instead of accepting all that is shown in the TV commercials. This pillow definitely is on the pricier side and going by the user feedback, does not seem too discouraging to try out either. Are you also suffering from uncomfortable sleepless nights? If yes, you should give it a try.